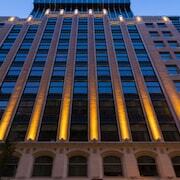 Convenient location to food and shopping area. Clean and comfy room. Where to find Port Coquitlam hotels near an airport? Where can I find hotels in Port Coquitlam that are near tourist attractions? 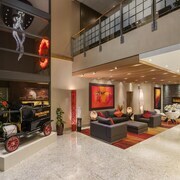 So, are you traveling in Vancouver Coast and are after a hotel or apartment in the Port Coquitlam area? Port Coquitlam has 9 hotels within a 0.1-kilometre (0.1-mile) distance of the center of town. The Poco Inn and Suites Hotel & Conference Centre is one of the most convenient hotels, as it is one of a small number of choices that is within walking distance of the Port Coquitlam downtown area. The Holiday Inn Hotel & Suites North Vancouver is located 19 kilometres (12 miles) from the main part of Port Coquitlam. 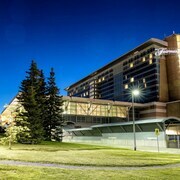 Another accommodation option is the Delta Hotels by Marriott Burnaby Conference Centre, which is located 17 kilometres (11 miles) away. Two more hotels and apartment options include the Poco Inn and Suites Hotel & Conference Centre and the Holiday Inn Express Vancouver-Metrotown (Burnaby). Like to travel a bit further afield? Vancouver Coast has a number of things to see. Vancouver Coast is known for forests, rivers and streams. 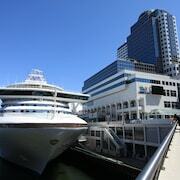 Commonly visited Vancouver Coast visitor destinations are old towns and fortresses. Visitors in this part of Canada can enjoy snowboarding. Looking for more to do? Spend a few hours enjoying the Holland Park and the Northview Golf and Country Club in Surrey, 8 kilometres (5 miles) to the southwest of Port Coquitlam. If you'd like to spend a few nights in Surrey, check Expedia's booking pages for the latest deals at the Sandman Suites Surrey-Guildford and Days Inn Surrey. 12 kilometres (7 miles) to the southwest of Port Coquitlam is New Westminster, which is home to the Inn at the Quay and Best Western Plus Coquitlam Inn Convention Centre. While visiting New Westminster, be sure to explore the Douglas College and Queens Park. 18 kilometres (11 miles) to the southeast of Port Coquitlam is Langley, a regional center with a population of 24,000, home to great places to see like the Langley Hospital, the Cascades Casino and the Canadian Museum of Flight. You might also like to check out the Newlands Golf and Country Club and the Langley Golf Center. Langley has places to stay to suit all budgets and tastes, such as the Holiday Inn Express & Suites Langley and Sandman Signature Langley Hotel. Situated 30 kilometres (19 miles) from Port Coquitlam is Vancouver International Airport. 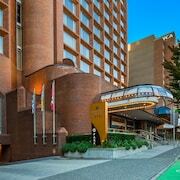 Stay nearby at Fairmont Vancouver Airport In-Terminal Hotel or Vancouver Airport Marriott. 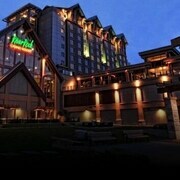 What are the most popular Port Coquitlam hotels? Are there hotels in other cities near Port Coquitlam? 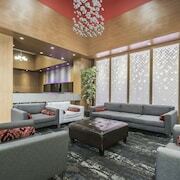 What other types of accommodations are available in Port Coquitlam? Explore Port Coquitlam with Expedia.ca’s Travel Guides to find the best flights, cars, holiday packages and more!